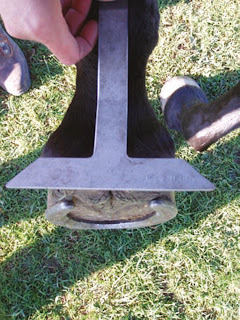 This is just a reminder and many of you will be familiar with me banging on about trimming but I think it bears repeating because I am still hearing (and reading) about gung-ho trimmers and farriers. 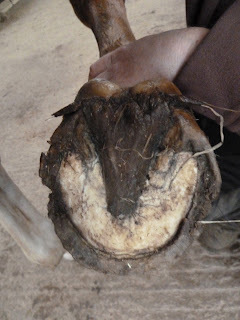 By its nature - trimming a hoof can only remove things. 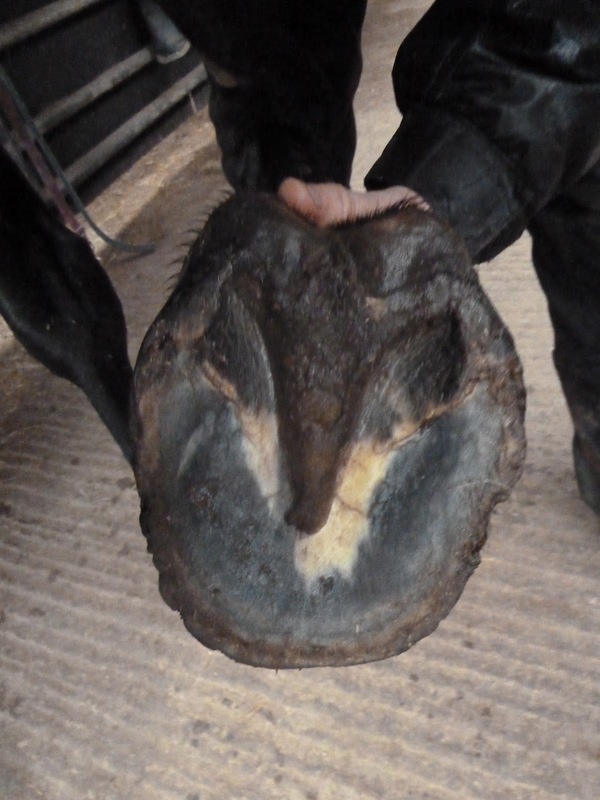 This of course is useful if you have a horse who is growing lots more hoof than he needs but very many horses actually have too little hoof structure (particularly at the back of the foot) rather than too much. Trimming is unlikely to be what these horses need - though movement may well be critical for them. Be wary of any hoofcare professional who is more interested in the appearance of the hoof than in how the limb and hoof are functioning. 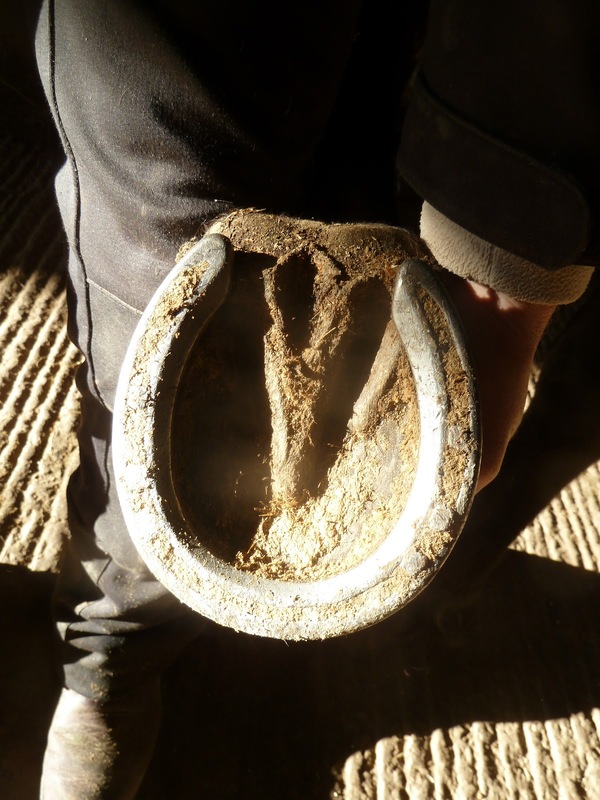 In fact, if your farrier or trimmer cannot show you how your horse's hooves are landing and loading then they won't know whether the horse is moving correctly and whether the foot is balanced. 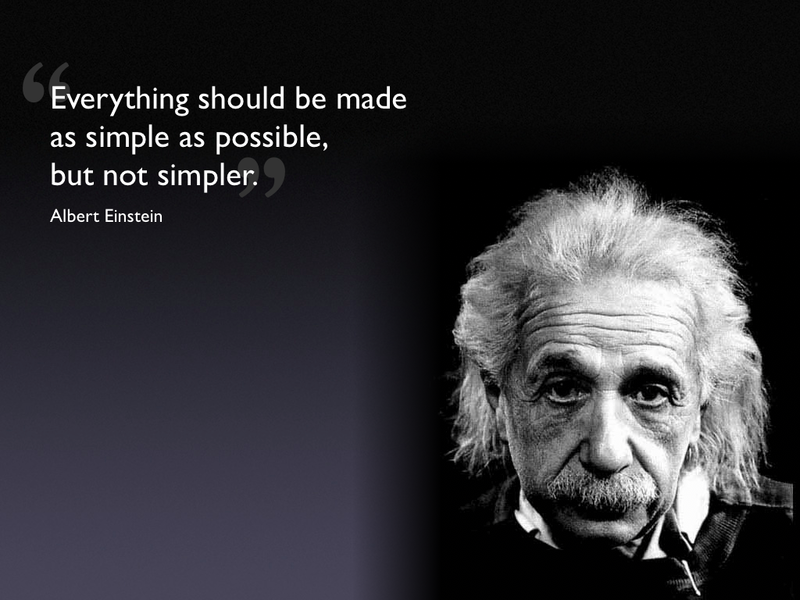 They also won't know what changes need to be made or what structures can safely be trimmed. Trimming without this knowledge can easily result in a horse who is less comfortable following a trim. A very quick blog post today but with some photos I am very proud of :-) On Saturday the weather was absolutely perfect - clear, cold and sunny - and after the disappointment of our earlier foggy outing, SB made it to his first day's hunting. Charlie was ideal because he has a much smoother trot than Felix and he has known SB for many years and they have a great relationship. Roll on Christmas, when his 3rd week of riding can commence - and another day or two out hunting, I hope! 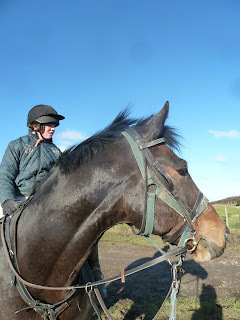 Rocky, who is a Selle Francais, has - like Thomas Two - been here for 4 weeks so today its his update. He arrived out of shoes, purely because he pulled his bar shoes off a day or so before he came down to Rockley. 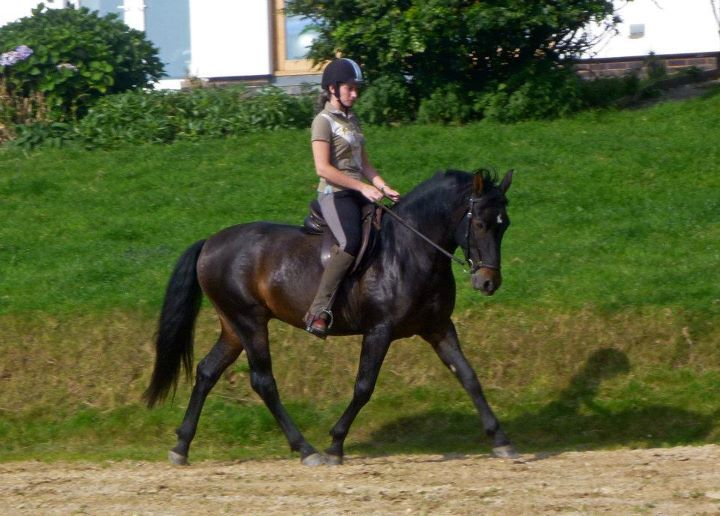 On MRI he had damage to fibrocartilage and the navicular bursa, DDFT and impar ligament damage. He'd been diagnosed as 2-3/10 lame on a circle and steroid injections and remedial farriery had not improved him. The upper photos of each set show him on arrival and the lower set after 4 weeks. His long toes are shorter than they were and there is a good angle of new growth - it won't be much longer before the nail holes are grown down and there is also going to be a big change in his medio-lateral balance though that's not visible from this angle. The sole shot gives you a hint about the changes in foot balance but they are only just beginning to occur. Rocky already had a much healthier palmar hoof than many horses when they arrive here, which makes the findings of DDFT and impar ligament damage more surprising. From this angle too it appears as if the foot is becoming more symmetrical - draw a line through the digital cushion and the more recent, lower shot is more balanced than the top photo, even given the slightly different angles of the photos. Thomas Two has now been here for 4 weeks. 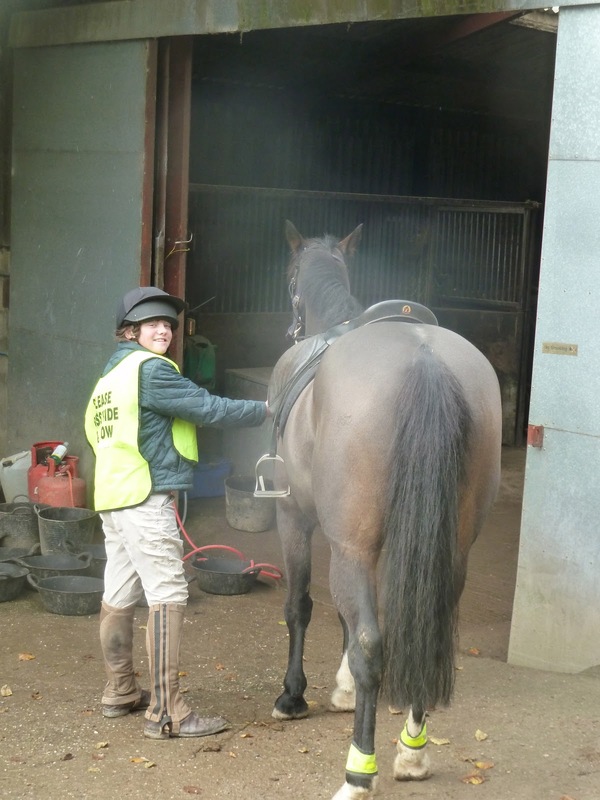 He went barefoot at the start of the year and has made good progress - when he arrived at Rockley he was already landing heel first and our mission was to try and take his hooves to the next level. A good place to start looking at hooves is always the hairline. On his first day Tom's hairline bulged at the quarters and you can see that his palmar hoof would like more support. 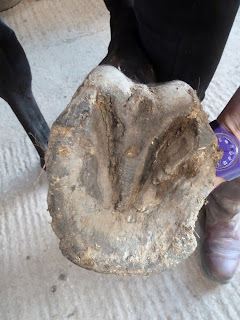 Four weeks later and we are making progress - a combination of the tracks and surfaces and controlled exercise is building on the good work already done and he has more development in the back of his hoof. From the sole, confirmation that the frog is building - the key to health in the back of the foot. ...why not go hunting? SB, my nephew, has been around horses since he was 5 and has spent many hours helping out in the barn but until last summer he hadn't been interested in riding. Unfortunately we were fogged off, so we all kitted ourselves up in hi-viz and rode the 5 miles home - and no doubt SB will be out hunting again on Saturday! 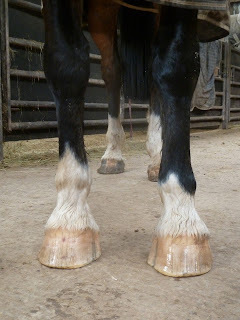 Following on from last week's post about bizarre hooves here is the second in the occasional series :-) One of the comments I received recently was from someone who - after seeing some of the bizarre hooves - asked "Do you just let them grow like that with no correction?" 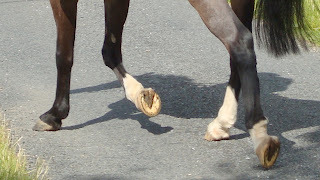 Here for your delectation are another set of hooves belonging to a different horse. If the first thing that jumps out at you is a medial wall deviation/flare and cracks then you would be in good company so don't feel bad! I suspect that most people would be much happier if the hoof looked like this - the red outline - all nice and symmetrical, neat and tidy and much more like a textbook "balanced hoof". That of course would mean trimming off all the asymmetric, untidy hoof marked in green - but surely that wouldn't matter - it can't be doing any good can it? 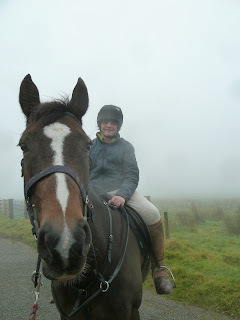 To give you a bit of background, I first met this horse as a 5 year old. He was nicely bred and had been sent to a training yard to be backed and sold on as a sports horse. The problem was that even in extremely light work (no more than walking round the block) he kept going lame. First he would damage the check ligament on one front leg, then he would be rested, treated, brought slowly back into work...and the other check ligament would go. It had reached the point where both trainer and breeder were at the end of their tethers. A friend knew I had an interest in rehabbing feet and we were asked if we'd like him. At this stage, of course, he was in shoes but as the trainer said, he had excellent feet so that couldn't be the issue. He did indeed have excellent feet - in the sense that they were concave, with strong hoof wall and were shod perfectly symmetrically. 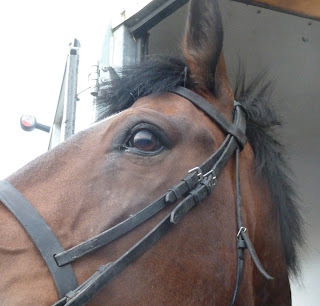 It might seem mad to buy a youngster with a recurrent ligament problem but both Andy and I had a suspicion that there was more to this horse than met the eye. He had enormous charisma so we agreed to risk £500 and take a punt on him. That was almost exactly 6 years ago - he arrived at Rockley and came out of shoes in October 2006 (though he didn't look quite like this at that stage...). Although in those days I hadn't quite discovered "celery", I managed to let Charlie grow his hooves the way he wanted and though I occasionally fretted about his apparent "flare", over the next few months as he got sounder and braver he made it extremely clear that he knew best how to manage his own feet. 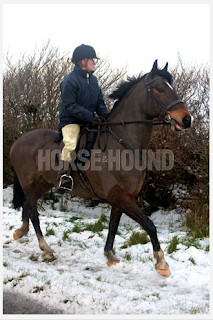 Since then he has hunted for 6 seasons, very often twice a week over the long, 9 month Exmoor season, as a field horse, master's horse and on the odd very special day, even as a huntsman's horse. He has covered literally thousands of miles up and down Exmoor, on incredibly tough terrain which would be enough to test even the healthiest check ligaments - deep boggy ground, stony uneven ground, hard unyielding tarmac and everything in between. 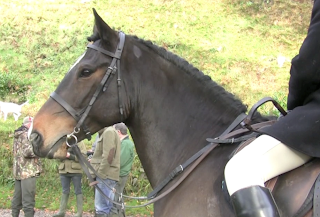 He has carried many different people out hunting and never failed to give them a brilliant day. New feet and photo malfunctions! New boy Alfie arrived last weekend and I didn't get the chance to put his photos on the blog last week. Alfie is a Morgan - a breed I've never come across in person before as they are relatively uncommon in the UK - and he has fairly tidy feet but a history of lameness and reluctance to go forward. MRI showed impar ligament and DDFT damage as well as some bone changes so now its over to us to see whether we can help Alfie get back on track. ...as are Bailey, Bryher and Teagan. Time for some updates today - the ex-rehabs have been incredibly busy over the last week or so and there have been so many fun updates coming in I just had to share. First up, an email from Sarah about her and Solar's progress. Sarah has worked very hard since Solar went home, first having to get on top of grass issues and then having to recover from a well-intentioned attempt to straighten Solar's feet. 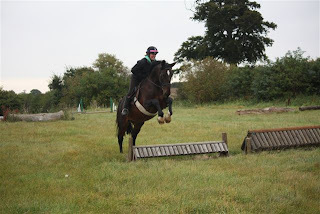 After a summer of hard work they were on terrific form at the RRR - this is Solar's first attempt jumping XC and I think you will agree that his enthusiasm and technique mean he could be on track for great things! I had to email you to let you know that solar appears to have found his engine!! We had a lesson on Friday, our first one in about 18 months. My instructor was hugely impressed with him & said he was looking the best she'd seen him! She also couldn't believe how forward he's become, he is having to be half-halted & steadied quite a bit! My yard owner is schooling him once a week too & when I asked how he got on today was told he's getting very forward! He still sees hacking as a chance to stroll along taking in the view but he is LOVING his school work! It's just another part of this journey that's come as a surprise, but oh, what a lovely one to have! All the best, Sarah x "
One of the main reasons that owners give for shoeing a horse is to provide "support" for the limb. 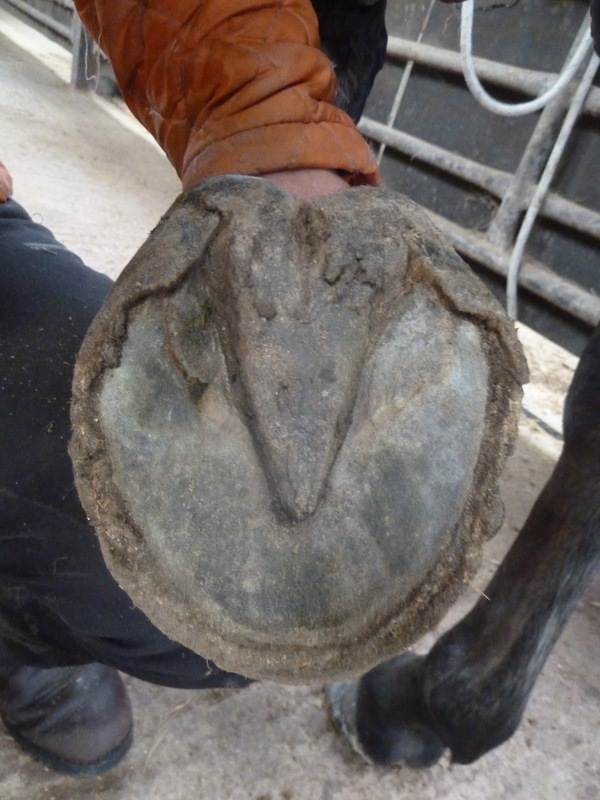 I've always been a bit puzzled by this phrase because if we are honest all a shoe does is shift the loading area of the hoof to the edge - but more importantly I've generally found that the hoof does a far better job of providing support than any shoe. 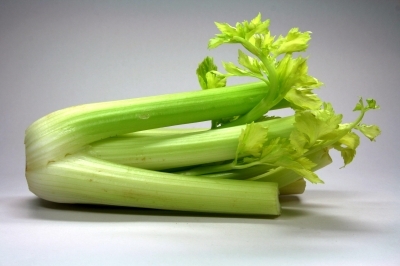 Take Millie as an example. 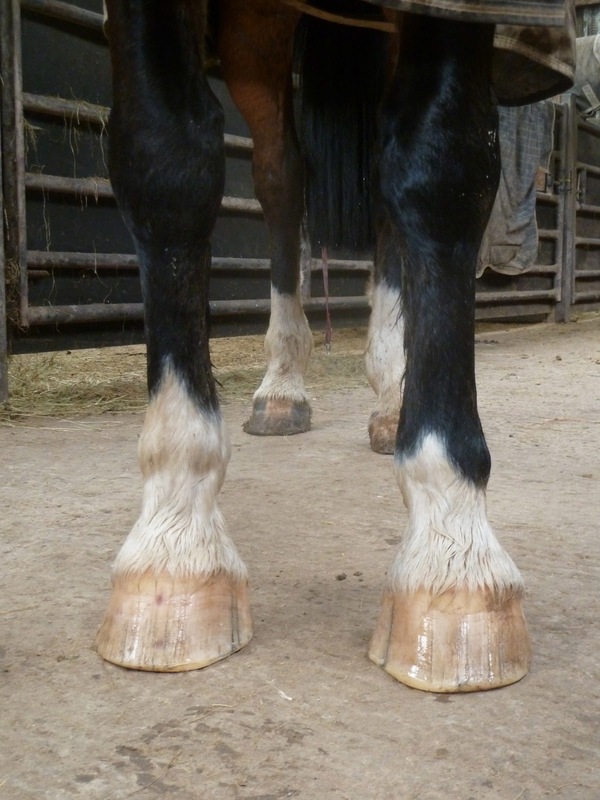 She is particularly fascinating because although she has come here with a front limb navicular diagnosis she also had some conformational wackiness going on with her hind feet and legs. Both her owner and I were quite concerned about her initially (she arrived a few days out of shoes) because the angle of her hind feet was putting strain on her joints and it looked as if she would overload the lateral side. A few weeks down the line, however, and its surprising how fast her hooves are stabilising the limbs. 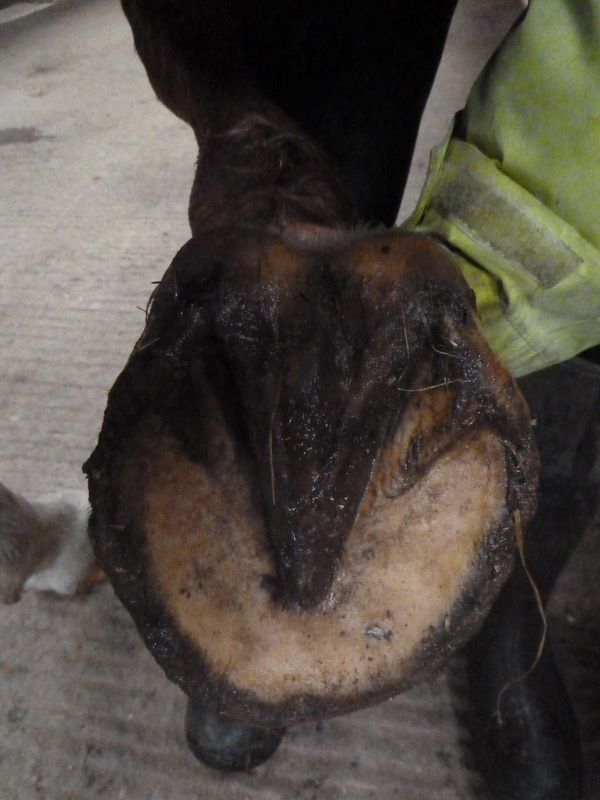 She has had the conformation issue for a number of years and it didn't really change in shoes but who would have guessed how supportive her hooves could prove to be, given the chance? These are her front feet from day one and (below) after 4 weeks. Some rebalancing but lots of improvement still required. I suspect with Millie though that her hind feet need to be right before she can properly load her front feet so I suspect her to improve from back to front. Millie's shoes had come off just before she arrived and over 4 weeks her feet have become stronger, as you can see from these photos. Interesting again how - far from her feet breaking off out of shoes - they are actually growing down stronger. This is the most revealing angle to assess change in "navicular" horses - if the palmar hoof is becoming stronger and loading more evenly its a good sign that we are on the right track. So the answer to the question? 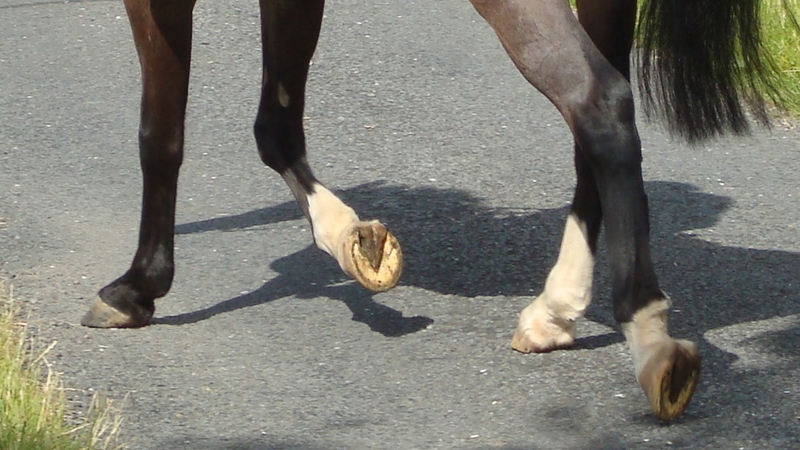 The best way to support the limb is to allow the hoof to do its job. 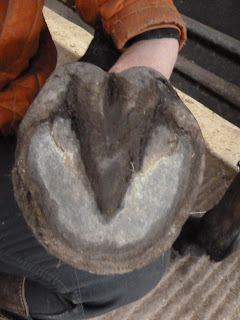 The power of the hoof!